On May 5th of this year (i.e. 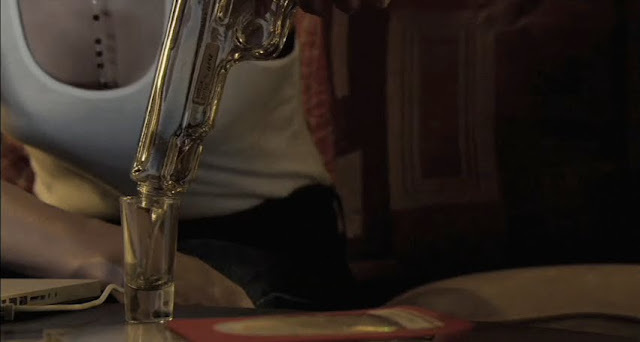 Cinco de Mayo), Robert Rodriguez debuted a trailer for Machete that presented the film as a reaction to increasingly tight control over illegal immigration. This was just days, as I recall, after Arizona passed their unheard-of measures to tighten their border, and Danny Trejo's introduction provides no room for misinterpretation. And yet, two weeks later, Robert Rodriguez showed up to clear some things up. The immigration angle isn't all that important to the film. He just cut the trailer that way as a reaction to what was going on in Arizona. Isn't it fun what you can do to change the tone of a film through editing? But now I have to wonder if someone put him up to it, because Machete is all about the state of immigration, and more specifically the debate about immigration, in this country. It's pretty much the entire thrust of the narrative. There are more than a couple instances where the film stops dead for a character to tout the virtues of keeping the borders quasi-open. Those against illegal immigration are portrayed as either naive, misinformed, or completely and totally evil. And even though anyone who says this is calling for a race riot is probably a little nuts, there is sort of a rallying cry thing happening here. And whatever your feelings may be about the issue, it makes for a fascinating, if not totally successful, piece of filmmaking. It's an overstuffed film, for starters - too much plot that doesn't pay off or matter at all. 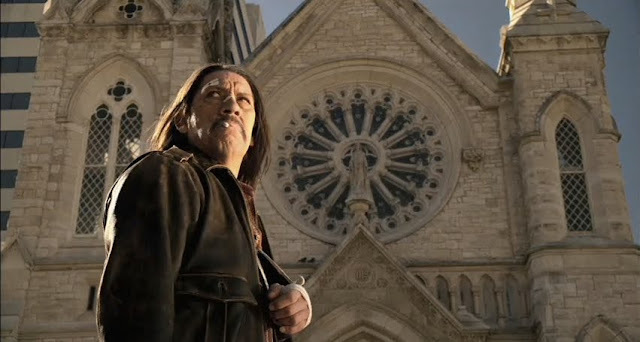 It's one thing to say we're really just going to see Machete (Danny Trejo) hack his enemies to tiny pieces, but the film clearly demonstrates that it shares our interests. The opening scene, which details how Machete arrived at his current predicament, is really phenomenal, and the straightest take on the grindhouse aesthetic in the whole film. The execution of this scene will provide the template for all similar scenes to follow - when your protagonist uses a giant knife as his key weapon, the action should be up close and blunt. And so it is. Rodriguez and Maniquis aren't shy about the show they're putting on here. At one point two nurses with uniforms ending just under their crotch step out of a van and grab semi-automatic rifles, and we get the big two-shot of them standing side-by-side blasting the hell out of everything. There are many, many low-angle hero shots of people holding gigantic weapons. Everything you think Machete is will absolutely prove to be true. Whether or not that's a good thing is totally up to your own taste. As super-violent macho men movies go, though, on a pure craftsmanship level, this was head-and-shoulders above The Expendables. Even if it does get too caught up in its own storytelling, following too many threads to unsatisfying, unnecessary conclusions (huge aspects of Michelle Rodriguez's role could have been covered in one scene), when Machete does get rolling, it really gets rolling. As for the lefty preaching, I guess if that sort of thing bothers you, then you're out of luck. I've never much minded a film preaching politics opposite my own (as in The Dark Knight). It's just a little rough when they upset the narrative flow, which can be the case here. But hey, at least it's interesting for a film to have a strong, polarizing point of view for once.